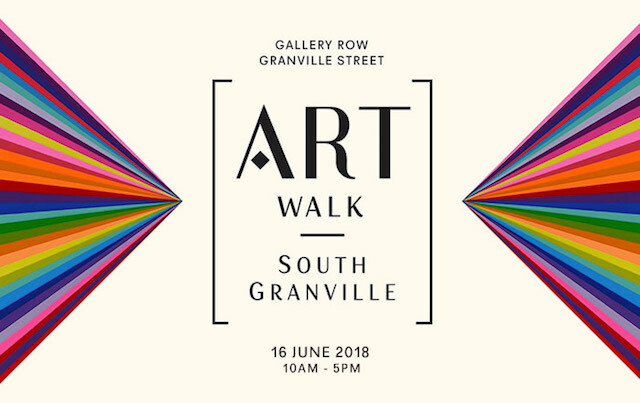 The South Granville ArtWalk returns the 7th year, organized by the galleries of the South Granville Gallery Association (“SGGA”). Everyone is welcome to be part of this art-filled, interactive event on Vancouver’s original Gallery Row in the vibrant neighbourhood of South Granville. Experience Artwalk 2018 by strolling along Granville Street between 6th and 16th avenue to find your perfect style of art. Enjoy artist talks, demos, refreshments, tastings, prize draws, pop-up shops, over 10 different art exhibitions and much more. Explore a wide diversity of art, from historical to contemporary with local artists in attendance to showcase their new works. Enjoy artist receptions, collaborations with local shops (like L’Occitane, Small Victory Bakery), painting demos, wine tastings and more. South Granville has the highest concentration of fine art galleries in Vancouver, its legacy as gallery row is cemented as it continues to thrive a half-century since its founding. Several new galleries have moved into the area since the first ArtWalk, adding to SGGA’s reputation as the only area in the city where one can tour the full breadth of artwork available in Vancouver. You’ll find a diverse range of art including Canadian and International conceptual, European modernism and old masters, historical and emerging Canadian art including photography as well as two galleries devoted to First Nations and Inuit work. The special events organized for this one-day-only affair draw art enthusiasts and collectors alike out to admire works by seasoned masters and to discover emerging young talents. Follow the South Granville BIA on Facebook, Twitter, and Instagram for more information.